Makar Sankranti is one of the most auspicious festivals of the Hindus and is celebrated in all parts of the country with great devotion. The transition of Sun from Sagittarius to Capricorn sign during the winter solstice is known as Makar Sankranti. This journey of Sun is considered sacred, symbolizing the relationship of Sun with the life on the Earth. 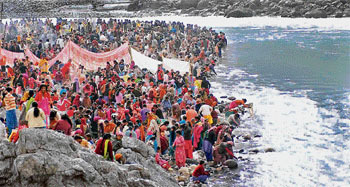 It is an holy occasion for the Hindus and they celebrate this festival by bathing in holy rivers, throughout India. In Himachal Pradesh Makara Sankranti also known as Magha Saaja, marks the start of the month of Magha. The devotees wake up early in the morning and take ceremonial dips in the water springs. The day starts with an early morning puja and burning of paza leaves. In the daytime people visit their neighbours and feast on Khichdi with loads of ghee and chaas. A huge number of devotees also visit the famous Tatapani hot water springs on Makara Sankranti to take a holy dip. Apart from curing skin diseases (due to Sulphur content) bathing in this water body is also considered to be auspicious. The devotees make Tula Daan, where they make offerings of cereals to the priests equal to an individuals weight. The offerings made on this day hold greater significance since, this act helps in alleviating ones sufferings. A Lohri- Makar Sankranti festival is also organized at this place, where a number of stalls are set up which mostly sell colorful sweets, artificial jewellery, toys etc. The festival lasts for a week but the valley remains crowded until the last week of January. The festival culminates with singing and Naati (Himachali folk dance).